Click below to view more information about other services we provide. 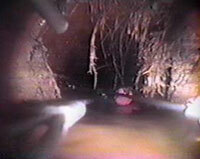 Video camera line inspection has become so vital in the plumbing industry that we at E.Z. Roth Plumbing refer to our cameras as “a plumber’s best friend.” When wanting to determine the cause of clogs and stoppages, a video camera line inspection is essential. Prior to the technological advancement of video camera line inspection, contractors were only able to guess what was causing sewer line problems; an accurate account of any damage was only known after the completion of (laborious) digging or an excavation. Our video camera line inspection allows us to provide you with a service that is accurate, efficient and cost effective. We insert into the pipe a flexible rod with a high-resolution video camera on its tip to identify the cause of the problem. The recorded video allows us discover which sections of pipe are damaged, crushed, broken, punctured, collapsed, disjointed, penetrated with roots, etc. After diagnosing the condition of the water or sewer line with our camera, our built in radio transmitter allows us to accurately determine the depth and location of the sewer line, in case we need to perform pipe line repairs or a sewer line replacement. After our video camera line inspection, we can provide you with a recorded copy of the inspection. To schedule an appointment, Call (323) 469-5692 or contact us.